A seat in Burnaby would insert him into the thick of the Trans Mountain pipeline debate. 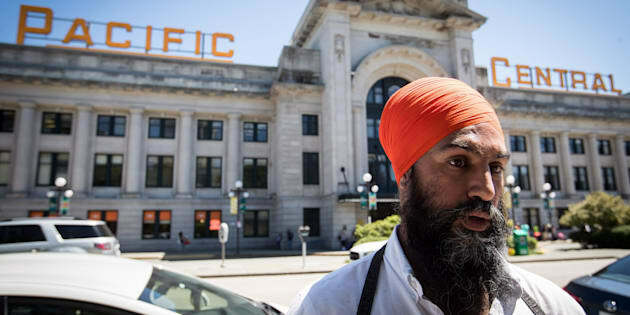 NDP Leader Jagmeet Singh speaks at a news conference outside Pacific Central Station in Vancouver, on Friday. VANCOUVER — Federal New Democrat Leader Jagmeet Singh says while he has been encouraged to run for Parliament in the newly vacated British Columbia riding of Burnaby South, he won't be making an announcement yet. Singh spent Friday in Metro Vancouver, with two planned events in the riding that New Democrat MP Kennedy Stewart vacated last month, allowing him to run for the mayor's seat in Vancouver. Singh, who was elected leader last October but doesn't have a seat in Parliament, says both Stewart and several interest groups have encouraged him to run in Burnaby South. He says he wanted to take the opportunity to speak to British Columbians, Canadians, and particularly those in Burnaby South, about the issues impacting them. Singh confirmed he recently met with local health-care providers who also urged him to run. The NDP leader says while he is honoured by the warm receptions he has received in B.C., his ultimate goal is to address Canada-wide concerns. "Issues that impact Canadians are issues of affordability, affordable housing, access to medication, these are important things we're going to continue to talk about," he says. Hamish Telford, an associate professor at the University of the Fraser Valley, says he believes Singh has had difficulties attracting attention as the NDP leader because of his absence in the House of Commons. Telford says if Singh ran in a byelection taking place near where the contentious Kinder Morgan pipeline is being expanded it could help him gain traction in the national media. "If he joined that byelection race it would insert him at ground-zero of the pipeline debate."